The most comfortable way to travel to Tikal is by air. For around $200 you can make the round trip flight from Guatemala City to Flores any day of the week. The plane ride lasts a minuscule 30 minutes (amazing compared to the 12 grueling hours it takes to get there by car). From Flores either hire a guide or rent a car and drive yourself the remaining hour to Tikal. The “Ways” app is very helpful if you choose to brave the roads for yourself. It is possible to access Tikal from Belize as well. I have heard that this trip takes 4 hours in car. Tip #2 - Ojo! Watch out! If you plan to overnight near the ruins, there are two main cities people choose to stay: Flores & El Remate. Both are lovely towns. We chose El Remate because it is a 1/2 hour closer to the ruins than Flores and because we had heard from family that it was a great place to stay. (See my review of the hotel we stayed in, La Casa de Don David to learn about this simple and wonderful hotel.) Please also note: if you are uninterested in swimming in the lake and only care to go to the park, the closest place to stay for the night would be at the hotels that are actually in the park like the Camino Real, Tikal. Tip #5 - Wear Mosquito Repellant! A pick-up truck with comfy make-shift seats helps to transport those who are unable to hike the trails in Tikal National Park. Lightweight and easy to use, this godsend of a water filter is what the only way we drank water the entire stay in Guatemala! Staying hydrated in the heat and humidity is very important. Filtered water is a must due to the poor sanitation conditions in Guatemala. Instead of lugging around a large quantity of bottled water, we have found that it is easiest (and most budget-friendly) to carry a water-filtering system with us. 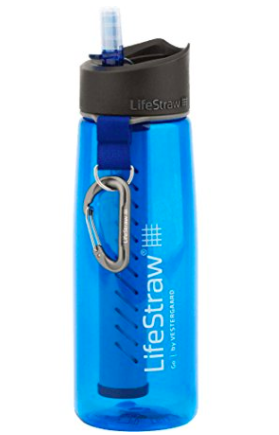 The best, and I mean best, discovery we have made is: Lifestraw. It was created for children in developing countries who have no access to clean water. It is now sold as an accessory for campers and travelers. The straw inside filters 99.9% of bacteria. We used the straw inside the park and all over Guatemala and neither myself, my daughter nor my husband got sick. It is a godsend for people like me who have extremely sensitive stomachs!!! Do anticipate the possibility of encountering gorgeous plant and wildlife. The jungle is dense and it is possible to focus so much on the ruins that the wildlife goes unnoticed. I wish we had more hours to just sit and observe. On this trip we encountered spider monkeys jumping through the trees, heard howler monkeys, watched several coatamundis walk right past us, saw parrots, and carpenter birds, and we enjoyed unusual butterflies flittering from one tree to the next. We were cautioned about snakes, but thankfully did not encounter any. See more about the animals we encountered here. Tip #10 - Expect Rain, this is a Rainforest! Enjoy seeing the world from atop the ruins of one of the world’s most fascinating ancient civilizations. Bon voyage!